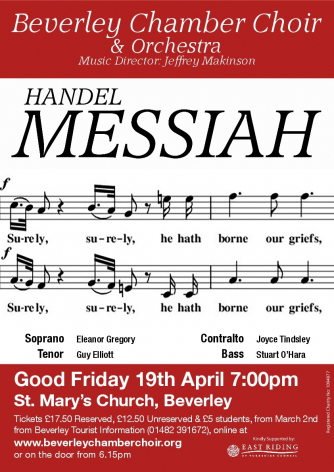 This Good Friday April 19th marks 20 Years since Beverley Chamber Choir’s first Good Friday concert in St Mary’s Church Beverley. Now under the direction of Jeffrey Makinson the choir will be joined by a professional orchestra drawn from musicians from the North of England, in the intimate setting of St Mary’s Church Beverley, to perform a small scale version of Messiah by Handel. This Good Friday performance with 35 singers is intended to be very similar to Handel’s original which he oversaw in its first performance at Easter in Dublin 1742.